Valerie was born in Duncan, B.C. and after a couple of moves, her family settled in Port Coquitlam. She now lives and works in Richmond. Val credits her paternal Grandmother for piquing her interest in knitting and her Mother for keeping her interested. She first cast on at about aged 8 and really hasn’t put her needles down since. She increased her knowledge of stitch and construction techniques using “The Knitters Handbook” by Montes Stanley, a resource she still refers to. Valerie is a teacher librarian at an elementary school in Richmond, BC. Educated at both UBC & SFU she also did graduate studies in Quebec. Being a librarian, it’s no surprise that reading is a hobby. Val belongs to a book club that she’s passionate about. Just like the WCKG, she enjoys the friendships as much as she enjoys the books. A single mom with a teenaged son, she’s a busy gal! She says she would love to do more travelling and has wonderful memories of a summer trip to Europe with her son. Stephanie Pearl-McPhee’s (aka the Yarn Harlot) first book was a game changer. Before reading the book and then following Stephanie’s blog, Valerie had no idea that there was a community of knitters out there…she thought you just knit at home! She calls herself a Ravelry troller… trolling the website looking for patterns! She also designs and sells on Ravelry (check her out…Knittinghobbit) as well as “tweeks” designs to make them her own. Nothing is too much of a challenge, and she loves to try out a new technique on some fingerless gloves (she’s famous for these) or a baby sweater or two. When asked what her favourite project was Val really didn’t hesitate…an Aran sweater knit for her (then) 11 year old nephew. He proudly wore it for his grade 7 school picture. Just to note that as we were chatting, Val was knitting a somewhat similar sweater for her grand nephew…the aforementioned nephew’s 7 year old son! What’s in her knitting basket that’s not finished? Two sweaters (is that all?) are awaiting completion and may never get there she says. One has been left alone for four years (a knitting machine project done on her instructor’s machine) and the other has been abandoned for about 20 years. She said she doesn’t feel so badly as her Mom has one that’s been unfinished since her Dad told her that he’d never wear it…50 years ago! Valerie just can’t stop knitting with green & purple…check out her beautiful purple lace & beaded shawlette in the photo. A self professed “yarn snob” she really only knits with natural fibres and has a special love for merino, silk & alpaca. 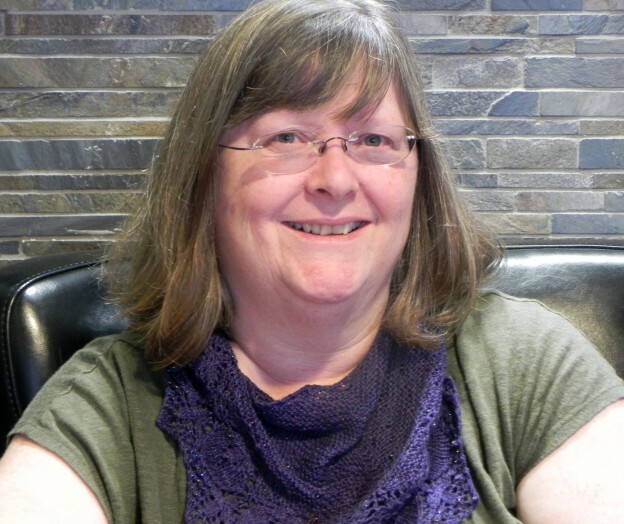 A member of WCKG since 2007, she loves the community feeling of being with like-minded people who just love to knit. She especially enjoys the guest speakers and all the information that they share. As the Guild’s Show & Share coordinator, she takes real joy in seeing (and touching!) everyone’s projects during that portion of the meeting. She is herself a frequent contributor to Show & Share and is especially known for her intricately knit fingerless gloves and beautiful baby sweaters. This entry was posted in member profile on November 1, 2014 by Marlene P..